Your immune system is a complex network responsible for fighting off harmful bacterial, viruses and chemicals. An autoimmune response such as celiac disease places stress on the immune system, which might leave you more susceptible to illness. Additionally, if you’re stressed or feeling run down, you may need to start making a conscious effort to improve your diet by consuming nourishing foods. Food is one of the most powerful tools you can use to help support and keep your immune system strong. Here are 8 powerful immune boosting foods you can start to implement into your diet to help boost your immune system and allow your body to repair quickly from sickness or low immunity. Vitamin C is an extremely important nutrient required to build up your immunity, it also increases the production of white blood cells which are key to fighting infections. 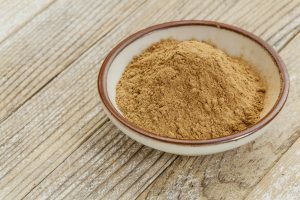 Changing Habits Camu Camu is one of the highest food sources of vitamin C. It is 460x higher in Vitamin C than the average orange and is surrounded by other nutrients that help you use the vitamin C in the food. You can add it to your smoothies, chia pudding, smoothy bowls, raw slices, bliss balls, juices, gummies and ice-blocks. Garlic contains the active ingredient allicin, which fights infection and bacteria. 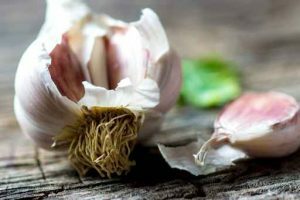 Garlic is one of my favourite ingredients to add to so many dishes such as soups, stews, curries, broth, fermented vegetables, mash, eggs and mayonnaise. Garlic has been used for centuries for both food and medicine. It’s extremely rich in anti-fungal, anti-bacterial and anti-septic properties. It also contains manganese, Vitamins B6, Vitamin C, selenium, calcium, copper, potassium and phosphorous. Garlic boosts the immune system and also aids the body’s natural detoxification process. 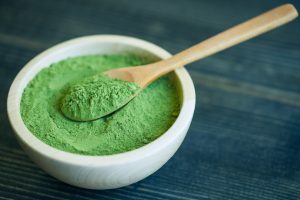 Spirulina contains immune boosting properties and is also rich in selenium and iron which are both powerful antioxidants in the body, it’s also high in Vitamin B12 and easy to absorb iron. All of these properties help the body to decrease the activity of free radicals that damage the body, and enhance immune function. If you need to boost your greens intake try the Changing Habits Supreme Green Blend as it contains a beautiful mixture of chlorella, spirulina, barley grass, broccoli sprout powder, kelp powder and green leaf stevia to sweeten it. You can add this powder to ice-blocks, nice-cream, smoothies, quiches as well as a number of other savoury dishes. Everyone could probably benefit from a little more turmeric in their lives. 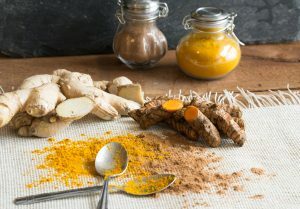 Curcumin is the active component in turmeric, it contains very powerful antiviral, antifungal, anticancer, antibacterial and incredible anti-inflammatory properties. Turmeric is also a powerful antioxidant that can fight free radicals which damage the immune system. In Ayurvedic medicine turmeric is also considered to be a natural antibiotic. It’s great for those people experiencing respiratory infections and common flu symptoms. A simple way to have turmeric is in a turmeric latte. 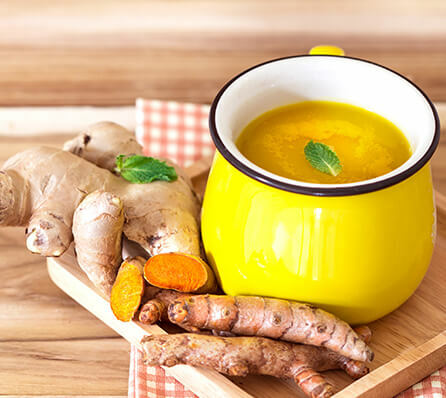 Mix the following ingredients:- ½ tsp of turmeric, 1 cup of coconut milk, ginger, cinnamon, and a touch of liquid stevia, honey or pure maple syrup to taste, in a small saucepan over a low heat. Read more ideas of how to include more turmeric into your diet here. Ginger is an immune system booster and is commonly used as a natural treatment for the common cold and flu. It helps to remove mucus and nasal congestion, ease coughs, and can relieve a mild fever by inducing sweating. Ginger is capable of performing its wonders because of the varying active components it contains, making it really great for those suffering from nausea, cramps or a sore stomach as it helps to relax the intestinal tract and ease inflammation. Try steeping some freshly sliced ginger in some hot filtered water and drink as a tea throughout the day. Your grandmother was right, chicken soup is one of the best medicines to have when you are sick and need to boost your immune system. The gelatin, collagen and amino acids contained in bone broth and chicken soup help support, heal the gut and reduce inflammation. It’s also rich in a component called carnosine which has been shown to inhibit damage from viruses in the body and it contains minerals that support the immune system. You can read more information about the benefits of bone broth here. Did you know that 70% of our immune system is housed in our guts! One of the best and most powerful ways to boost your immune system is through consuming probiotics. Probiotics are living microorganisms that provide us with a wide variety of health benefits, including producing vitamins A, K, B1,3,5,7,9,12 and essential fatty acids which supports our immune system and helps us digest food. 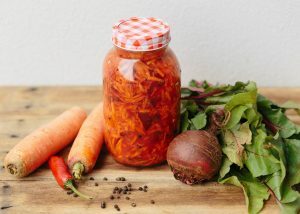 You can read more about the benefits of probiotic rich foods here. Zinc is an immunity-bolstering mineral. Many people, these days, are deficient in zinc which is unfortunate, because even mild zinc deficiency can increase your risk of infection. Zinc in your diet is very important for the development of white blood cells, the immune system cells that recognize and destroy invading bacteria, viruses and pathogens. 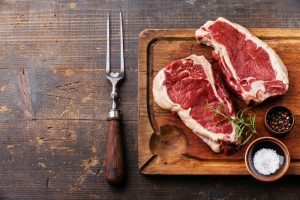 The zinc found in grass-fed beef and lamb is well absorbed by the body. Please note that if you’re taking zinc supplements + eating lots of zinc rich foods that too much zinc can actually inhibit the immune system function. There are many other things you can do to help protect you and your family from cold and flus and boost your immune system, however start with implementing these immune boosting foods and see how you feel. If you are looking for more tips on how to boost your immune system so that it recovers quickly after surgery you can read more here and here. None! of these have worked for me. I am a Lymie and I’ve done it all. I wish it was as simple as a diet change. I’ve been on this quest for a long time and at least 3/4 of these I am using and have used for years. No better. I hope it works for someone as I know we are all very different.